At BSA you will experience single-room maternity care. This means that you will labor, give birth, recover and receive post-partum care all within the privacy of your own Birthing Suite. Each room comes with a queen-size bed so your birthing partner can stay in the room with you. The private bathroom in each suite has a Jacuzzi tub and shower for the mother's comfort after labor. Cesarean (C-section) births take place in one of our surgical suites located just steps away from the Birthing Suites. BSA is the first hospital in Amarillo to offer C-section delivery for expectant moms without opioid painkillers. For an opioid-free C-section, physicians still use medication for pain management, but the side effects are less, including decreased bloating and constipation and a faster recovery time. After a C-section, patients and families are taken to one of our Birthing Suites to spend time with their new arrival and receive post-partum care. Want to receive personalized pregnancy tips and information on your baby's development? Learning to breastfeed your newborn baby can be one of the hardest tasks you’ll face as a new mom, but our caring lactation nurses are here to help. Our specialized team of certified lactation nurses, including the only bilingual lactation nurse in the Panhandle, provide assistance to new moms at BSA. Even after going home, our lactation consultants are just a phone call away on our Breastfeeding Hotline at (806) 212-5548. Mother and baby share the same room after delivery so you can strengthen the bond between you. Of course, if you'd like a break or want some undisturbed rest, our nurses will be happy to care for your baby in the newborn nursery just steps down the hall. BSA is the only hospital in Amarillo with a nursery. In the event that your baby is born prematurely or needs special care, our Level III-designated Neonatal Intensive Care Unit (NICU) is here for you and your baby. 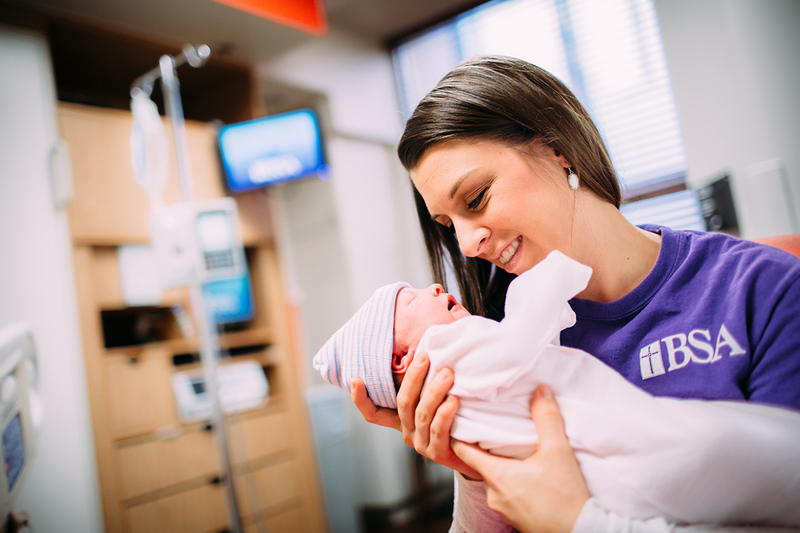 Leading the way, the BSA NICU was just the second NICU in Texas and the first in the Panhandle to earn the designation as a Level III Neonatal Intensive Care service provider from the Texas Department of State Health Services. As a Level III NICU, BSA provides expert care for newborns who need highly-specialized treatment, including babies with low birth weight and those born as early as 22 weeks. 24-hour in-house coverage by specialized personnel. Highly trained Registered Nurses care for your baby. An average nurse to patient ratio of 1:2. Board Certified Neonatologists and Neonatal Nurse Practitioners on staff. Personalized care and parent education. Parent Rooms for rooming in with your baby. Continued support after discharge with referrals, consultations and an annual NICU Reunion Party. BSA Hospital is proud to announce the launch of neonatal transportation through Apollo MedFlight, a critical care air ambulance service provided for babies born prematurely who need highly-specialized treatment. The BSA Neonatal Intensive Care Unit (NICU) transportation team flies to rural communities to transport babies by airplane from area hospitals to the Level III designated BSA NICU. During the flight, a specialized team comprised of a NICU physician or nurse practitioner, nurse, respiratory therapist and Apollo flight crew member care for the baby. A warming isolette with the only high frequency oscillator ventilator in the region. The BSA NICU transport team is available 24/7.